Vyonni de Mel is the director of Afterworks. Ms. de Mel is from Sri Lanka and has extensive experience in children’s education and program management both in the United States and internationally. She holds a General Certificate of Education from Princess of Wales College, Colombo, Sri Lanka, and an M.A. in Children’s Ministries from the Episcopal Divinity School, Cambridge, Massachusetts. Bilingual in English and Sinhalese, Ms. de Mel brings to her work an acute appreciation of the challenges newcomers face, as well as the strengths that a diverse American society can offer. 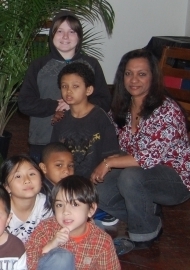 Ms. de Mel assisted as a consultant in setting up Graceworks, an afterschool program in Medford. She was also the recipient of the City of Cambridge’s Peace and Justice Award in 2000, and presented a talk, “Welcoming Children to Empty Church Halls: Developing Multi-Cultural After School Programs,” at the 2001 Ed-Fest at the Episcopal Divinity School. Lead teacher Katrina Vilensky was born in Russia and moved to the U.S. when she was in high school. After graduating from UMass Boston with a degree in psychology, she spent three years working at CCRC, a referral center for parents seeking child care and afterschool programming, before coming to Afterworks. All staff members receive ongoing training in early childhood education through the 21st Century Community Learning Center Partnership. This is an Agenda for Children program offered through the City of Cambridge. Its goals include improving communication between schools and afterschool programs, and professional development in math, science, and literacy. Staff members are always available for discussions with parents about their children’s social and academic progress and to serve as liaisons between school and home. Sallie Craig Huber (Chair) is a parishioner of Saint Peter’s Episcopal Churchand has supported Afterworks since it opened. Now retired from a career in global public health, she volunteers one day each week at Afterworks in addition to serving as chair of its Advisory Committee. Vyonni de Mel is Director of Afterworks, a member of Saint Peter’s, and the former head of St. Peter’s church school. Pat Drake is the treasurer for both Afterworks and Saint Peter’s. She is a parishioner at Saint Peter’s and teaches ESOL for the City of Cambridge at the Community Learning Center. Pat’s children were among the first Afterworks students during its first two years of operation. Chet Krupkowski and Daliris Torres are parent representatives on the board. Arlyne Jackson is a parishioner of Saint Peter’s and head of the Pardee Management Library in the School of Management at Boston University. Jamie Sasaki-Febvay is a parishioner of Saint Peter’s. The Rev. Sarah Conner is the interim priest at Saint Peter’s. 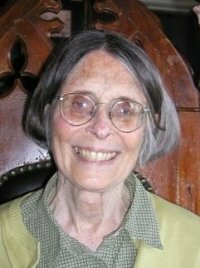 In June, 2012 we lost Julia (Judy) Bibbins, member and former Senior Warden of Saint Peter’s Episcopal Church and chair of the Afterworks Advisory Board. Judy was a longtime supporter of Afterworks, an advocate for children and the arts, and a gracious, loving presence in our lives. We will miss her.